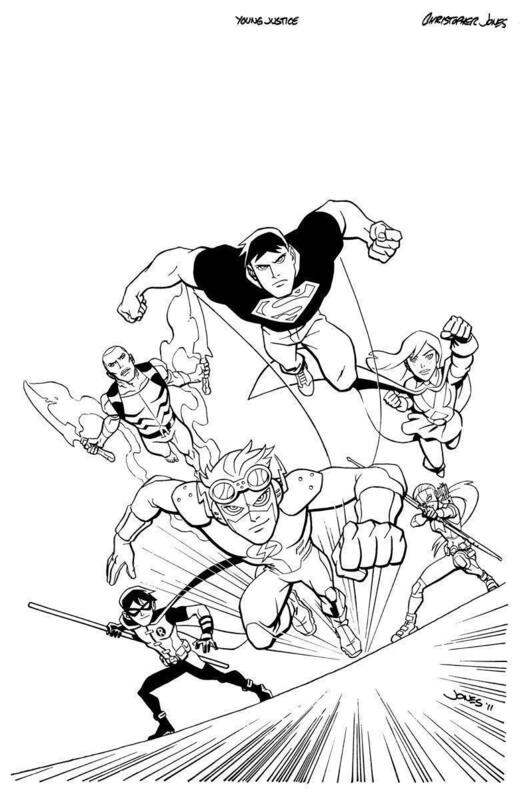 A familiar name to fans of DC Comics monthly series and animated titles, artist Christopher Jones brings his unique style to the Young Justice DC Comics title, a new comic book inspired by the animated series of the same name. In the following Q & A, Jones discusses his past work, such as his tenure on on the fan-favorite DC Comics title The Batman Strikes!, and the challenges that await for him with Young Justice. The World's Finest: First up, care to refresh readers on your recent comic book work? Where might they know you from? Christopher Jones: Well I'm probably most widely known for my run on The Batman Strikes, which I was the regular artist on over it's entire run. Before that I'd done a number of things at DC, from other animation-based work like Justice League Adventures to some short stories in 80-page Giants, to fill-ins and even breakdowns on Day of Judgment, the crossover event series that turned Hal Jordan into the Spectre. Prior to that I'd done horror, crime and sci-fi material for a number of smaller publishers. Since The Batman Strikes, I've been doing a busy doing a lot of comics-related work that hasn't actually been for comic books. I've done a bunch of work for DC Licensing, and for Disney and Marvel, but it's all been marketing stuff and pin-ups. So it's really fun to get back to telling stories in a monthly title again! WF: Now, on to the Young Justice! How did you get the assignment and what can fans expect from your tenure? Are you in it fox six issues, like the previous creative team, or for the long-haul? CJ: Well the previous creative team were solicited for six issues, but I'm actually take over the art as of issue #5, and then continuing on with the new writing team on #7 and beyond. At this point my commitment is open-ended. WF: Some of your recent projects have resulting in adapting your own style to work with other styles, such as on The Batman Strikes, Gargoyles: Bad Guys, and now Young Justice. Is it tricky to find that balance where it's still your style, but also recognizable as the style of the project your adapting for comics? CJ: I don't even think of it that way anymore, really. There's a question of learning the main character models and getting a sense of the style of the design, but so much of what goes into drawing a page is still all me - my sense of storytelling, composition and design... even a lot of your own drawing style bleeds through, no matter how faithful you're being to the animation models. WF: As a semi-follow-up, even though you're still early into your run, I'm curious to ask - how does working on the Young Justice comic compare to working on The Batman Strikes title, in terms of not just nailing the art styles but also having reference material and having more knowledge of the the cartoon Young Justuce is based on? As for any other comparisons, I actually find the look of Young Justice less stylized than The Batman, so the drawing feels a lot more natural. WF: You'll be working on the title with Young Justice animated series producer Greg Weisman and series writer Kevin Hopps. Have you been in touch with them about their plans for the comic and how it'll mesh with the animated series? Is there a certain kind of authenticity that comes with the comic having a creative team directly involved with the series itself? CJ: I haven't had a chance to talk to Greg at length about it yet, although I'll be seeing him in person in a couple of weeks and am hoping to really pick his brain then. There's a problem that most multi-media spin-offs have where the spin-offs have to fit seamlessly into the "canon" continuity of the source material, which means they can't really have stories that break new ground with any of the main characters or otherwise have lasting consequences. But with Greg and Kevin writing the comic, there's a very exciting opportunity for the comic to compliment the animated series in a really unique way. For example, the first two-parter they've written for the comic delves into Artemis' backstory, stuff that hasn't been revealed on the show. We even get a flashback to events seen in the show, but now seeing more of these scene, getting Artemis' point of view. It's cool stuff. 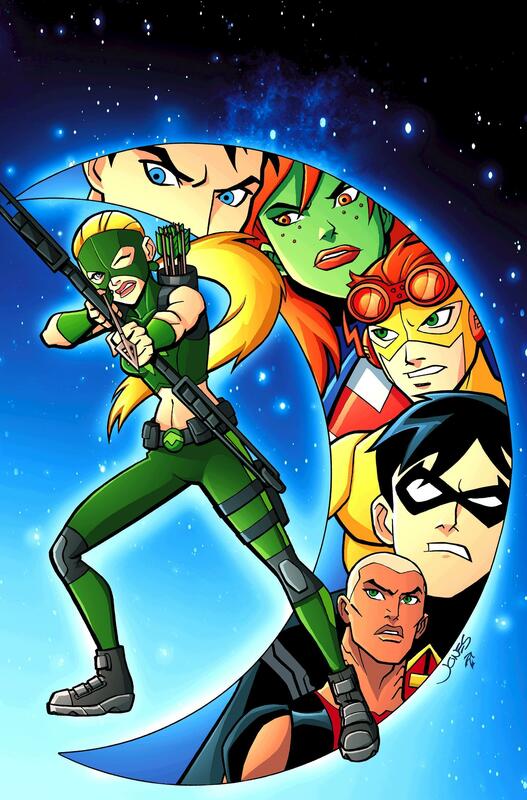 WF: Are there certain Young Justice characters that are already popping up as your favorites? WF: Any thoughts on being back in the Johnny DC fold, especially given your incredible work on 44 issues of The Batman Strikes? Do you hope for a similar run on Young Justice? Perhaps a guest-shot on Batman: The Brave and The Bold? CJ: I have no idea how long this will run, so I'm not counting on 44 issues! Back during the The Batman Strikes days, I was strongly advocating for a The Batman Strikes/Teen Titans Go! crossover, but that never happened. Young Justice is an odd Johnny DC title. The show is written to be fairly adult, and I think with Greg and Kevin coming on board you're going to be seeing the comic move a lot further in that direction. And I never approach this stuff like I'm drawing a "kid's book." I think of them as all-ages books. They're kid-friendly, but hopefully satisfying for adult readers as well. With The Batman Strikes I was always shooting tonally for the great Bob Haney/Jim Aparo Batman: The Brave and the Bold comics from the 1970s. Those were friendlier to a juvenile audience than a lot of modern-day Batman comics, but they still played the drama straight. WF: Finally, can you drop any hints of what we'll be seeing in Young Justice in the coming months? Any preview art you can share? CJ: I've gotta keep the art under wraps until the books come out, but I'll be happy to share some pencils and and behind the scenes stuff once the issues are out! The only thing I can say about the future of the comic or the show, is if you're expecting that Young Justice is about a team of sidekicks who'll be face off against the second- and third-tier villains of the DCU, you expect wrong! The big guns are coming! WF: Lastly, tell us why fans should pick up your debut of Young Justice! And there are s'mores! And great art! and s'mores! Young Justice #5, Jones' first issue in his ongoing tenure on the title, will be available Wednesday, June 22nd, 2011, both on comic book shelves and digitally.